Sixth-grade Eli Teslovich is a fresh-faced Western Pennsylvania floor-general, and coaches praise his court presence, ball control and acumen. 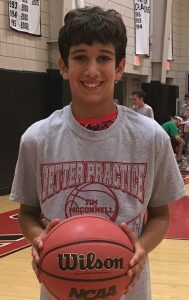 Young Teslovich anxiously practices like his back is against the wall while hoping to get a scholarship offer from Coach K of Duke University Blue Devils. He is apted to drain a deep three pointer, score ambidextrous at the basket, or perform flamboyant plays in half-court. Teslovich’s mission is to dunk on a 10 feet rim before entering high school. He already has 21.5 vertical. “His commitment to success is second to none,” said Teslovich’s mother. Nowadays, cultivated Eli is rated a MSE top-10 hooper in America. According to Teslovich’s teacher Mrs. Deborah Alekson: “Excellence demands hard work, determination, and focus, which continually add to one’s journey in life of growth and maturity. Take a few moments to gaze his eye-catching highlight video above.